How one person can simultaneously visit as many different musical territories as Kit Watkins does, and yet somehow master them all, is one of the aspects of Kit's music that is hardest to accept. And yet master it all, he does - without ever repeating himself in the slightest. A great case in point is Kit's 1990 release Thought Tones Volume 1. Where his earlier music was very much in the realms of prog rock and space music, with this disc Kit dove ultra-deep, producing an album of nothing less than perfect and undiluted ambience. We at Earth Mantra have listened to a lot of Kit's music, and indeed have listened to a ton of ambient music in general, and yet this release is unlike anything we have ever heard. Cerebral drones and tonality mingle effortlessly with atonal sound sculpting and orthogonal form, all completely abstract and without traditional musical trappings. And despite the fact the album is nearly twenty years old, the music is as fresh and original today as it was the day it was first released. 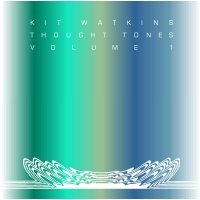 We also love Kit's consistent refusal to ever be boxed in by his instruments, and he does not disappoint on Thought Tones Volume 1. This time, his tools ranged from dulcimer to saw blades to claps of thunder, with nary a keyboard to be found. Brilliant. The more we listen to the music of ambient grand master Kit Watkins, the more we begin to grasp the genius behind his singular music. It's not just that his every release is a masterwork; they all are, of course. But it's that every release he does is somehow also a complete reinvention of his musical style. And that, folks, is nearly impossible for anyone to do. But here is the proof, for your listening pleasure. Really very interesting tonal work with systems of sound. Abstract but listenable. Excellent sound quality.